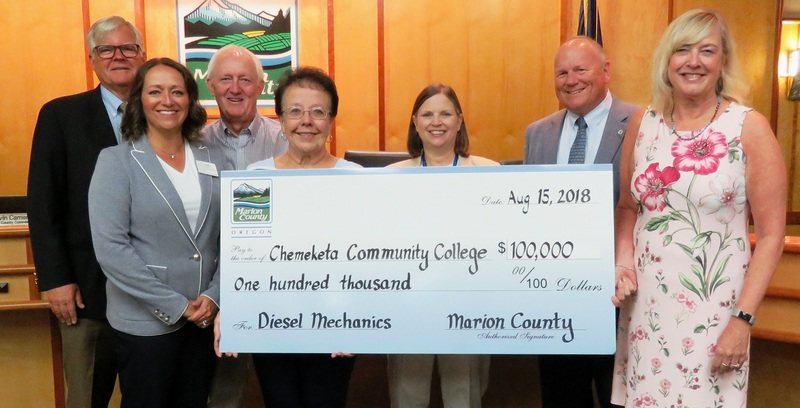 Salem, Ore., August 21, 2018— The Marion County board of commissioners have awarded a $100,000 grant to Chemeketa Community College to support its new Diesel Mechanics Program. This career technical program will serve a variety of businesses and employers within the transportation sector and will be located in Brooks, Oregon. Grant funds will be used for equipment and tools needed for students in the program. Students graduating from the two-year program will receive an Associate of Applied Science degree and be job ready in a field that pays a living wage and contributes to our region’s economic vitality. Program participants will be trained to work on both agriculture and transportation equipment which will serve all parts of the Chemeketa district, in particular, the rural areas that have a harder time finding qualified technicians. For more than 40 years, Chemeketa Community College has committed itself to transforming lives and our community through exceptional learning experiences in the Mid-Willamette Valley. As the second multi-campus district in Oregon, Chemeketa serves 50,000 students annually at its Salem and Yamhill Valley campuses, as well as Brooks, Eola, Winema, Dallas, Woodburn and Chemeketa Center for Business and Industry (CCBI). Chemeketa Community College is an equal opportunity/affirmative action employer and educational institution. Pictured from left to right: Kevin Cameron, Marion County Commissioner; Holly Nelson, Executive Dean, Chemeketa; Ken Hector, Neva Hutchinson, Chemeketa Board of Education; Janet Carlson, Sam Brentano, Marion County Commissioners; Julie Huckestein, Chemeketa President/CEO.